The Perfume Society are launching their latest and third Discovery Box for men, The Men's Edit, just in time for Father's Day. It contains eleven fragrances plus two grooming samples and is priced at £15 for VIP subscribers and £19 for non-subscribers. The box includes scents from Escentric Molecules, Jimmy Choo and Miller Harris, as well as a Penhaligon's moisturiser and Aromatherapy Associates eye gel. American actress Haley Bennett has been signed by Chloé as the new face of its signature scent for its 10th anniversary. She joins the likes of Clémence Poesey, Chloe Sevigny and Dree Hemingway, who all embody the brand's free-spiritied Parisian vibe. No amount of Chloé perfume can make me as cool as them sadly, but the Chloé signature scent and Love Story are among some of my favourites! Italian brand Etro have introduced their latest fragrance concept, Metamorfosi: the art of layering. Throughout the year, they will be introducing new and evocative fragrance blends, made up of their existing fragrances. So far, we have Greenery Mood, which combines Paisley and Vicolo Fiori, and the delightful Enchanted Garden blend of Etra and Royal Pavillion, with many more to come! If you're new to fragrance combining, this will be a great introduction for you and its a concept to keep in mind if you're building your Etro fragrance collection. There are two new additions to the Juicy Couture range, this time in its more luxurious Regal Collection. The first scent is called Royal Rose and includes notes of rose de Mai, incense and suede, and then there is Majestic Woods, which has notes of tonka, praline, amber and patchouli. Both are priced at £89 for 100ml. This summer, a new chapter of the cult classic Dolce & Gabanna Light Blue will be written, 16 years after the launch of the original, making the scents more vibrant and long lasting. Light Blue Eau Intense Pour Femme, has been reworked by Olivier Cresp and opens with lemon and apple, with a heart of marigold and jasmine and a base of amber woods and musk. Pour Homme also gets the Eau Intense treatment, and both scents are available from mid-May priced from £47. Gucci Bloom (from £68 for 50ml) is the first fragrance by new creative director Alessandro Michele. It is due to be launched in August, but you can actually pre-order your bottle now (limited to the first 1000 bottles), which is why I've included it in this month's line-up. The scent has notes of jasmine, tuberose, orris and Rangoon creeper, which is an exclusive note to this fragrance, sourced from India and also known as Chinese honeysuckle. I absolutely love the design of the bottle, and its sure to be a popular one! Trussardi Parfums are launching unisex scent The Black Rose, which is inspired by the Middle East. It has top notes of Saudi Arabian Taif rose, with a heart of amber, musk and pink pepper, and a base of patchouli and vanilla. It is set to launch exclusively at Harrods from 5th May, priced at £77.50 for 100ml. Atkinsons of London are launching a new fragrance in their Legendary Collection called Californian Poppy. The Eau de Toilette is a modern, radiant reworking of the 1908 original and is described as being "hip yet heritage", "modern yet vintage" and "bohemian chic". It has top notes of lemon, jasmine and pink pepper, a heart of poppy accord and orange flower and base notes of cedarwood, helvetolide (a sophisticated, modern musky note with a fruity pear aspect) and incense. It will be available at the end of May at Selfridges, and priced at £100 for 100ml. Lastly, there's a new scent from Eight & Bob, called Nuit de Megeve. It is inspired by the ski resort of the same name (although personally I find the time of year a bit odd for this launch!) and has notes of grapefruit, petigrain, clove, tonka, orris, black coffee, vetiver, tobacco and musk to create a woody, aromatic scent. It is available at Harvey Nichols from 12th May, at £125 for 100ml, and you can find more details about the Eight & Bob range here. 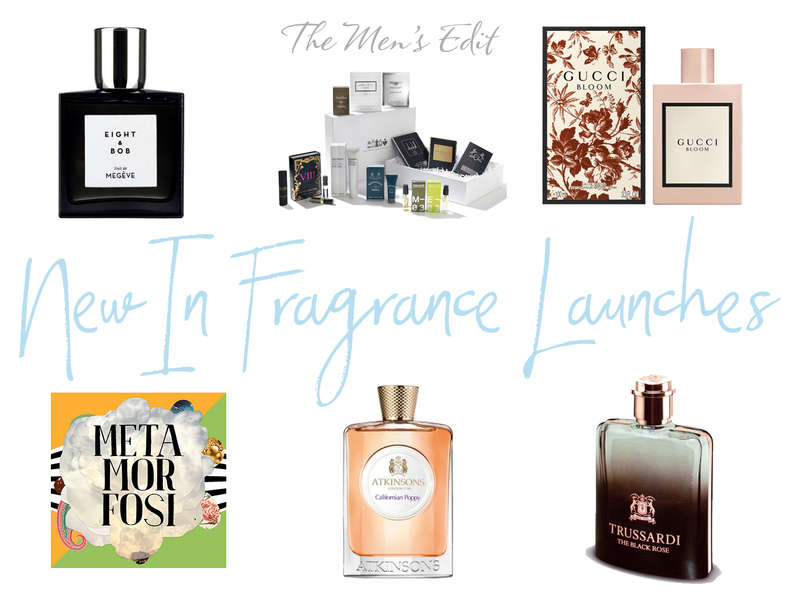 Do you have you eye on any of these new launches?